Inside the most attended temple in the city, there is a crypt where long forgotten rulers are buried. The construction is of such architectural beauty, that often nobles, important people and foreign dignitaries are invited to visit and pay respect to the rulers of past ages. The most important person buried in the crypt is Lord Pennsyl Ducardi, known to have been a king centuries ago. His sarcophagus had never been opened out of respect for the dead. One week ago an unsuspecting visitor forced open the sarcophagus’ seal. Lord Ducardi instantly reanimated as a mummy. A necromantic aura in the crypt was activated, and all the other sarcophagi opened and released undead creatures. The group of ten visitors was slain and turned into undead abominations. Father Dimitri Darev, in charge of the temple, told the city guard, who promptly sent a team of guards to control the situation. They didn’t return. Both the city guard and Father Darev are know looking for adventurers who will dare enter the crypt. Good payment is offered if they can control the undead creatures. The first level of the crypt has two rooms. The big one is a shrine to the temple’s god. The chests contain offerings to this god. The other room is just for storage. The temple uses this room to store food and other consumables. There is a second level, accessible through the stairways. Each stairway has access to one room only. The eastern room is abandoned and has nothing of value (undead creatures might be lurking about). The westernmost room was used for storage but it was abandoned for the one in the first level. There is a chest with old temple documents and some holy books (undead creatures might be lurking about). The third and deepest level of the crypt has three main rooms. The first one has a 12 ft. tall statue of Lord Ducardi, depicted in battle armor. The room contains two sarcophagi. This room connects to a crypt room and the main tomb. The crypt room has 4 more sarcophagi. The main tomb holds Lord Ducardi’s sarcophagus. He will be waiting in this room. The sarcophagi’s occupants can be inside them, or lurking around. Also, some of the crypt’s undead can easily be recognized as the slain visitors and city guards. This adventure can be played at low levels (1-3) by using monsters such as zombies, shadows, skeletons, ghouls and mummy for the main bad guy. 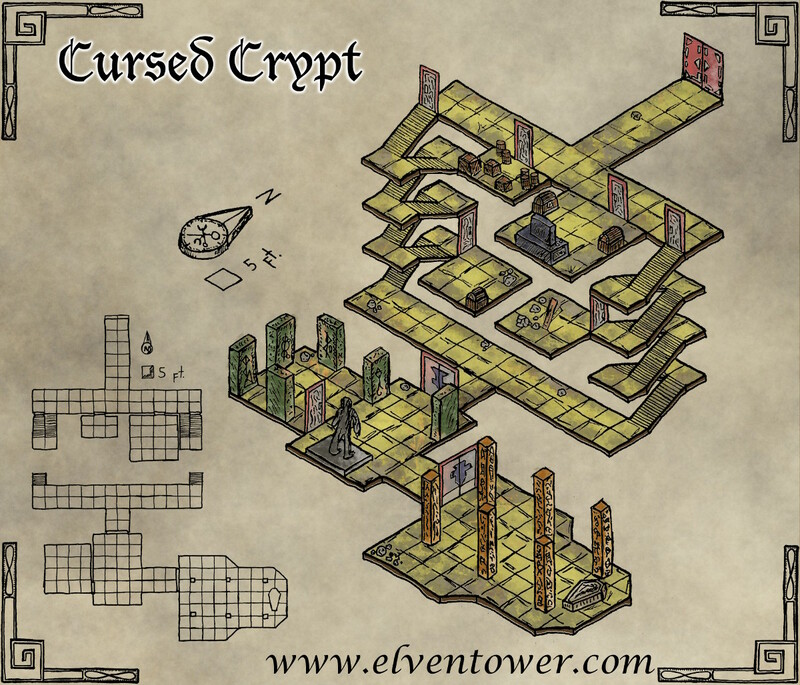 For higher levels (7+) this dungeon can be populated with ghouls, ghasts, wights, wraith and mummy lord for the final boss. Remember to never have the big boss alone, always use minions. You can find this map in High Resolution PDF in my patreon account. There are two versions, with and without tag names. My mapping ventures are funded through Patreon, It is thanks to people who like my work that I am able to continue mapping and providing RPG original experiences to people all over the world. If you like what I do, consider getting involved and backing me. What you get is impressive hi-def versions of my maps to be used in your RPG games (these have lower resolution), and the satisfaction of helping the rpg community grow bigger and stronger. Help me get funding and enjoy hi resolution PDF version of my work.